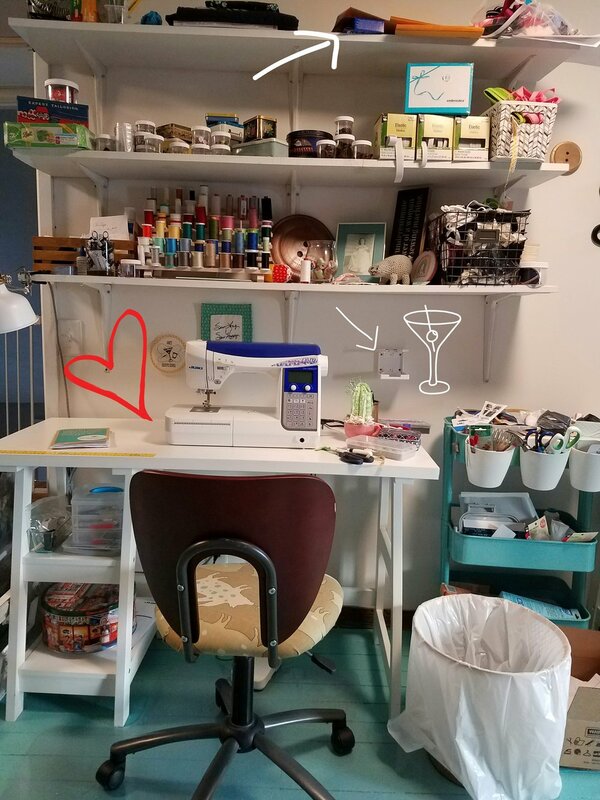 Anyhoozle, plenty has changed in my sewing space since my first post, Studio Tour, so I'm repeating a tour today. Maybe it will become an annual tradition to start the year with a tour. We'll see! It's fun to compare then and now, so I suggest you take a quick peak at the innugural space tour and note how clean it was. It looks positively desolate to me. Then, hold on to your seam rippers. I am posting un-staged, raw, unfiltered or edited pics. The space is the 3rd floor/finished attic of our home. Being an old house, the door doesn't latch properly so there's hooks and eyes on both sides of the door to keep it closed. I've only been accidentally locked in once. 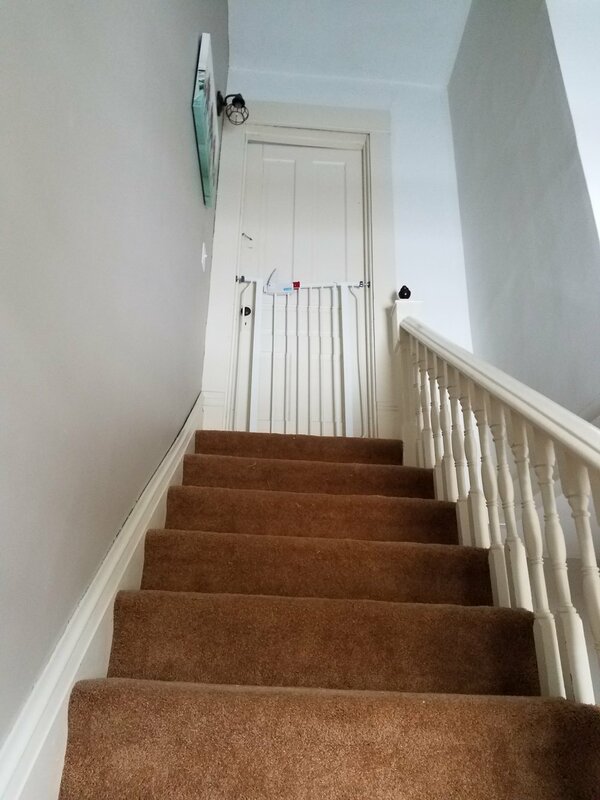 You might almost be able to appreciate the ombré effect of snipped threads that cascade down the stairs. This is my main spot. I was able to upgrade my first machine, a Brother SE400, to this Juki DX-2000QVP about a month ago. This new beauty and I are still getting to know each other. After sewing on one machine for 3 years, I've got some muscle memory to reprogram. There's a handy spot to safely hold beverages because #sewingbeer. Credit for that space upgrade goes to Lauren. Cheers, Stitching Friend! Nothing new over at the other desk. Still just a basic Brother serger here (DZ 1234), though I very seriously considered getting a Juki cover stitch machine. So far I'm doing fine hemming with twin needles, so I'm holding off for now. This wall is where my Stitch Happens piece is gonna have to go, that is should I ever get around to putting the back on and quilting it and such. It's bigger than the clothes pin lets on. There's a spot under the serging table where my sister spilled some wine when she visited in the fall. I won't be trying to clean those stains. And that cone of thread is on the floor because the baby just knocked it down. Over to the ironing board. There's where Stitch Happens is actually hanging out right now. She's under that stack of knits. And yes. This is scorch central. I've heard washing helps with the toasted look, but I have yet to give it a go. And here's ye ole stash, er, fabric library. I really love the open shelving. Sure beats the big plastic bins I was stashing in before. While they were clear, it really was hard to access the fabric and I used to make an enormous mess looking for stuff. The baby is over a year now. A toddler. She is very uninterested in spending any time in a playpen no matter how spacious and is able to escape. I ought to take it down, but it does slow her down a wee bit still. This corner is the doing of the middle child, the threenager if I may. She really enjoys mommy's sewing room and she's allowed to play with unwanted scraps and such. She hides my wonder clips and scissors and whatever else she fancies. I mostly stay out of her zone, unless I need my wonder clips back. The giant safety pin is new too. Those come as a 2 pack from Amazon, if you can't live without them either. There's the Birkin flares I'm avoiding cutting because I'm afraid of fitting pants. ETA- I made the Birkins! And here's a pile of denim slated for all the muslins I was cautioned are necessary in order to get a good fitting pair of jeans. A lovely IG-worthy shot. I'll show you what's just outside the frame. I love the look of the barn wood, but I have to be careful not to rub against it. I guess it shouldn't come as a surprise that it's dirty! Pattern pieces and suitcases abound. And the opposite wall is off season clothing storage. The closets throughout the house leave much to be desired as far as storage goes, which I think is pretty typical of home from the late 1800's; we don't even have an entryway coat closet. The big white box is my wedding dress. Of course there's a mend pile I'm ignoring. I'm guessing I'll sew the new yardage underneath it before I actually do the mending, but we shall see. I think that's about it. It's amazing what staging and cropping can do to make one's photos "instagram-worthy" but I really love seeing the real, air-brush not included state of creative spaces. I'm excited to see where the second year of haphazard blogging will take us. Thanks for stopping by!